A compilation of the hints, tips strategies, and plots that I have discovered while playing through several games as the Vampire Counts. This is by no means an exhaustive list, and there are undoubtedly turn-by-turn guides available elsewhere on the internet, but this guide should be helpful for those playing as the Vampire Counts for the first time, especially in the early game. Brief Description of Each Faction. The Vampire Counts (VCs) begin in a bad position; they are stuck between two of the largest race-nations on the Old World map: the Empire (humans) and the Dwarfs (dwarfs). Thankfully, both race-nations have other things to deal with than Western and Eastern Sylvania, your starting position. Vampires are ageless and immortal, and they can afford to play the long game. Taking territory a bit at a time, and solidifying it behind you, is arguably the best strategy you can use. Vampiric Corruption is a useful tool on the campaign map, as it increases public order and causes attrition among enemies, but it takes many turns to establish, by default. VC Suitable Climates are anything human-based, including the Empire and its Provinces, the Border Princes, and the Bretonnian Kingdoms (mostly west). VC Unpleasant Climates include other nearby race-nations such as the Dwarfs and Greenskins (mostly east and south). This is another good reason to leave the Dwarfs alone until you can afford it. VC Uninhabitable Climates are those uncivilized areas of the map like the Wood Elf kingdoms to the west, and anywhere with too much Chaos Corruption. In the early game, it is unwise to expand too quickly; even though cities are the single biggest source of income for VCs, their armies in the early game are weak, and not well-able to defend newly-seized territory. The cost of new cities, new armies, and public order penalties must be accounted for before new territory is claimed. The first main "questline" of the VCs is to seize more and more territory, but survival and management of your current domains should take precedence most of the time. It is not worth it to seize a new town like Pfeildorf if it means you lose Castle Drakenhof to an invasion by Dwarfs or Greenskins. VCs need to take time to restore Public Order in their seized towns; since all of the other nearby race-nations have a diplomatic Aversion to vampires, their cities have stronger public order penalties. A military presence in an occupied town or city will forestall unrest and rebellions, but the military presence needs to occupy that site for many turns before public order is restored and there is a high enough level of Vampiric Corruption to start giving public order bonuses. Having a hero in the army with strong Vampiric Corruption traits can speed this along. An extremely valid strategy for the Vampire Counts is to seize control of towns and cities that were razed by other armies. The trade-off for this is that this can be difficult to accomplish, because in the first place, any army that is powerful enough to raze a city or town is likely your enemy, and will return to raze your new town soon after you found it. In the second place, if you are making friends with your nearby races, the conflicts that result in razed towns will be further away, and you will almost certainly have to travel extensively across uncorrupted terrain to reach the towns (this sort of travel causes attrition in your armies). The good news is that VCs can take over razed towns fairly cheaply thanks to Raise Dead. A half-stack army can move around the map and defend itself (or flee) long enough to reach a razed site. Then, the Lord of the army can use Raise Dead to summon a number of Zombies and Skeletons to fill out the ranks, reducing the cost of founding a new town on a raised site. After a VC player has researched cost-saving methods (see "Savings" in the "Treasury Management" section), this process can be comparatively very cheap, and give the Lord of the founding army a stack of cheap trash troops to defend the new town and keep public order until it can better defend itself. Even if an enemy returns and attacks your new city, you do not lose as much investment as other races do. Founding new towns on ruins also prevents you from having to go to war with the race-nation that used to occupy that city. The campaign map trait of the VCs is Vampiric Corruption, which grows steadily over time. Taking over settlements in a territory, garrisoning armies, and many Hero and Lord traits can increase the rate at which Vampiric Corruption spreads. It is worthwhile to have one hero in an army who has high Vampiric Corruption (part of the blue campaign traits at the bottom of the skill tree for Vampires and Vampire Lords) in order to spread it faster. Taking over a settlement in a territory also gives Vampiric Corruption in a range around that settlement, which means your armies do not suffer attrition in that range. When VCs take over a new settlement, it will suffer a public order penalty until Vampiric Corruption reaches 50% or higher. At that point, public order should stabilize at around 0, gaining or losing slowly each turn, depending on other factors. VC public order is directly related to the amount of Vampiric Corruption in a territory; the higher the Vampiric Corruption, the higher the public order bonus. The second effect of Vampiric Corruption is to cause attrition in any non-Undead army. (The only armies Vampiric Corruption attrition does not affect are the Vampire Counts, Vampire Coast, and Bretonnian Vampire Lords). Specific units may also be immune to attrition caused by Vampiric Corruption (such as stronger Greenskin units). Vampire Counts (VCs) benefit from large stockpiles of Dark Magic (hereinafter referred to as "money"). They have a slight advantage in the early game because the bulks of their armies are cheap trash troops like zombies and skeletons, meaning that they can save up money for larger projects and expenditures. Most of the VC gains come from their cities; unlike other race-nations such as the greenskins and Norsca, they do not get any special benefits from raiding and pillaging cities (though heroes can "specialize" in pillaging if they do it often enough, gaining bonuses to the amount of money harvested). VC research in the Lahmian tree gives bonuses to several different building chains, such as Repression (small gains of 100-150 monies/turn) and Vampire Crypts and Necromancer Libraries (large gains of 300-500 monies/turn). VCs play a long economic game; it takes quite a bit of research and specialization to have a high steady income. A lot of this income is based on reductions in upkeep costs for most of your army troops. All of the research trees eventually have upkeep reduction costs for specific army units, and there are several extremely valuable researches to perform in the early and midgame. Namely, these are "Master of the Putrid Horde" and "Defiler of the Ancient Barrows" under the Arkhan tree. These give free, no-cost upkeep to zombies and skeleton units, respectively. VCs benefit from large stockpiles of Dark Magic (hereinafter referred to as "money"). They have a slight advantage in the early game because the bulks of their armies are cheap trash troops like zombies and skeletons, meaning that they can save up money for larger projects and expenditures. Counting things like the additional cost to recruit units with Raise Dead, a VC player will often be forced to choose between upgrading their armies or upgrading their settlements. Bribery - It is a very good idea to save up money for diplomatic gifts to give to your surrounding race-nations, such as the Dwarfs and the Empire. Even though these are your two biggest enemies, and crushing them is your long campaign goal, in the beginning it is better to pay them off so they do not declare a two-front war on you. Small gifts can keep them happy enough so that they won't declare war, and medium or large gifts can improve their attitude enough so that they will agree to Non-Aggression Pacts or even Trade Agreements. Raising Dead - The major strategic strength of the VCs is their ability to raise large armies on short notice thanks to Raise Dead. Between city-based recruitment and Raise Dead, a VC player can raise a full army of 20 stacks in 3-4 turns, AS LONG AS they have enough money to pay the Raise Dead costs and at least a few turns of upkeep on the new army. Building Upgrades & Repairs - Building upgrades for the VCs get expensive fast; it can take several turns to save up enough money to buy a single building in one city or town. It is a good idea to stockpile a great deal of money, and then buy as many building upgrades as you can afford in your most well-defended cities. There is some synergy in VC buildings, meaning that one building will often benefit another building chain somehow. Research in the Lahmian tree also helps a great deal with income from buildings. The Vampire Counts (VCs) have a long history with the other race-nations surrounding them; in the past (and probably the present), they have been aggressive and war-like against the Empire and the Dwarfs, which are your two biggest neighbors. Accordingly, most of the race-nations around you have a Diplomatic Aversion to vampires, setting your starting relationship at a penalty ranging from -15 (Bretonnian Kingdoms) to -50 (Dwarfs), with the average being -30 (almost everybody else, including the Empire). 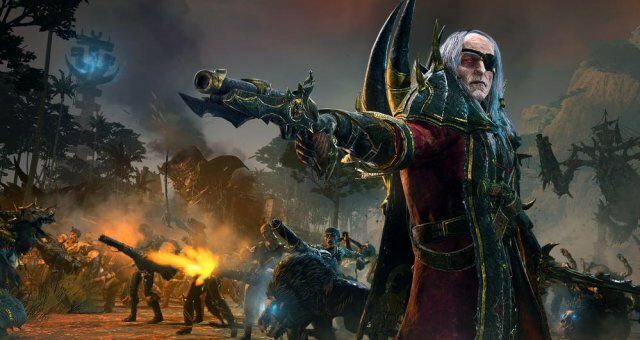 The closest allies of any VC nation are other vampire-based Undead race-nations, namely: The Vampire Counts, the Von Carstein Bloodline, Templehof, Mousillon, The Barrow Legion, and the Vampire Coast nations in the New World. Your first mission playing as a Vampire Count is to exterminate the Templehof faction; I would advise that you continue this policy until Templehof has only one settlement left. Assault this settlement, but afterwards choose to Subjugate Templehof as your Vassal, instead of exterminating them entirely. Optimally, Templehof will seize an Empire Province territory outside of Western and Eastern Sylvania, which you should pick as your final target to Subjugate them. In this way, Templehof will 1) give you tribute each turn in the form of money, 2) act as a buffer between you and more aggressive Empire Provinces, and 3) eventually become a steadfast trading partner. A similar policy can be adopted with the Von Carstein Bloodline or the main Vampire Counts faction led by Mannfred, depending on which you have chosen to play. It is wise for a VC player to choose from the beginning who they will ally with (if anybody), and who they will keep as long-term enemies. This helps control the amount of wars that the VCs are fighting at any given time, and therefore the number of fronts they are fighting on. Even if your chosen allies have a diplomatic Aversion to you, this can eventually be mitigated and overcome. The safest way for VCs to gain diplomatic relations with their allies is to offer them gifts in the form of money. Maybe the quickest way to gain diplomatic relations with allies is to send Heroes to attack and harass the enemies of their allies, since this can be done every turn, and the diplomatic bonuses stack with your chosen allies (and the penalties stack with your chosen enemies!). For this purpose, I recommend using Necromancers to "Steal Technology" from an enemy settlement, as this will give a bonus to your research speed. If you have chosen an enemy far away from Sylvania, then actions such as "Assault Garrison" are less beneficial to you. Counter-intuitively (but very much in keeping with the themes of Warhammer), the VCs do not have any special positive relationship with the forces of Norsca or the Chaos Warriors. As a Vampire Count, your weapons are the black arts, guile, and terror. In the early game, a Vampire Counts army will probably have to field twice as many low-level troops as any other army to have a good chance of winning. The starter troops - zombies, skeletons, ghouls - have numbers, but very little else going for them. No Ranged Units - Perhaps the main weakness of VC armies is their almost complete lack of ranged units, unless the player wants to super-specialize in order to get all of 2 ranged units. That is a maximum for your entire campaign, not per army. The only ranged units VCs ever get are Sylvanian Crossbowmen and Sylvanian Handgunners, both of which are available only through the Von Carstein Bloodline specialization. But Flying Units! - To make up for the lack of ranged units, VCs have several flying units: Dire Bats, Vargheists, and Terrorgheists. These are extremely useful as mobile troops to strike enemy units from behind, while they are engaged with your main body of slower troops. Keep the flying units out of range until the enemy is otherwise engaged, then use them to disrupt and cause morale damage, or to chase away broken units so that those units do not return to the fight. Vampire Lords, and Bloodline Lords also have access to flying mounts at level 10 (Hellsteed, a black pegasus) and level 18 (Zombie Dragon, which is everything you need in this game). Vampires access the Hellsteed at level 10. Keep Your Army Tight - don't spread out too far, or send your units too far away from your main force. Weak units can be picked off, and all VC troops will start to disintegrate if they lose their morale. Even strong units like the Varghulf can be overwhelmed and start to disintegrate if outside your heroes Leadership Auras. If you have incoming reinforcements for your side, try to meet up with them as soon as possible, sending only quick, disposable troops to harass the enemy and slow them down before the main engagement. Keep An Eye on Morale - The TWW2 interesting take on the Undead is that they do have morale, and it is a constant concern for an army commander. Unlike other races, VC troops will not flee when their morale is low or broken; instead, if a VC unit loses its morale (even Heroes and Lords), they will start to take heavy health damage, and the troop can die in a few seconds. Many VC Lords and Heroes are excellent assassins; Vampire Lords and Vampires both regenerate hitpoints while in melee combat, giving them great staying power. Wight Kings - Your front-line fighters. Well-armored, with a strong attack and damage, Wight Kings are best used to bolster a weak line, assassinate enemy heroes, and lead charges. Vampires & Vampire Lords - Both are commander-type units, meaning that they give strong bonuses to the Leadership of your hordes, which is extremely valuable if you field large numbers of weak units like skeletons, zombies, and ghouls. Spread your Vampires throughout your deployment, so that these units are always covered by the leadership aura. Vampires (the females) lean more towards magic, and can be upgraded to be strong spellcasters, or melee combatants. Vampire Lords (the males) are strong melee combatants and leaders. Necromancers - Spellcasters, meant to be stationed behind the front line to support with spells such as Invocation of Nehek, Raise Dead, and Wind of Death. The main concern with Necromancers and spellcasting Lords is not to cast too many spells too quickly; save up your Winds of Magic reserves to keep regeneration high, and casts spells only when you need to protect or support expensive units. Keep in mind that you can cast Inovcation of Nehek on Heroes, Lords, and single units such as Varghulfs to heal them to full. Banshees - Your hero assassins. Quick, deadly, and with a chance to ignore physical (non-magical) damage, Banshees excel as assassins both in battle and on the campaign map. They are not as good in prolonged engagements as units of incorporeal troops are (Cairn Wraiths & Hexwraiths), so save them for decapitating strikes that will demoralize the enemy army. VC units can be divided into the following categories: weak/strong, slow/fast, easily-broken/army-breakers. Siege Weapons - Vampire Counts get siege weapons like other race-nations do, and they can also use Crypt Horrors, Varghulfs, and Terrorgeists to destroy city gates quickly. Dire Wolves & Dire Bats - Harassers; use Dire Wolves and Dire Bats in the same way: to chase down enemies who are fleeing because of Fear or Terror, or use them to attack an embattled enemy unit from behind, and deal even more morale damage. Dire units can keep broken enemies off your back, so that the enemy unit does not regain its morale and return to the fight. The advantage of Dire Bats is that they can fly over a battle, instead of having to go around. DO NOT USE against armored troops with high morale! Crypt Horrors - Even though they are few in number (6 in a full unit), Crypt Horrors are very useful because they are probably the first unit you will field that has Armor Piercing attacks. Varghulfs - (Varghulves??) With speed, armor-piercing attacks, regeneration, and huge size, varghuls are excellent formation-disruptors and hero-slayers, taking out chunks of powerful units with each attack. They do need support, since they have comparatively low morale, so you can group them with your hero or lord to create an assassination squad, or send them plowing through the enemy ranks while they are engaged with your Skeletal Spearmen or Zombies. Varghulfs also deal great damage to city gates; two Varghulfs can take a gate down in about a minute. Use spellcasting (especially Invocation of Nehek) judiciously; like money, VCs benefit from stockpiling their Winds of Magic reserve, to either cast several spells in rapid succession, or make sure they have enough Winds of Magic to cast a spell at the right time. Every Lord and almost every Hero has Invocation of Nehek, which heals a friendly Undead unit, and can reanimate lost units. Aside from its obvious uses during battle, Invocation of Nehek can be cast after the battle is finished but before you leave the battle screen (assuming you won), to heal and replenish your troops for the next fight (especially if you have another enemy just waiting to pounce on your weakened army). A good part of the battle-play for the VCs is control over morale; just as low morale is a dangerous weakness of your armies, it is also a powerful weapon against your enemies. Several VC units cause Fear or Terror (ex: Hexwraiths, Terrorgeists), and several Heroes can be upgraded to cause Terror as well (Vampire Lords), so spread them throughout the line of battle and have them attack different units one after another. When a unit routs, send Dire Bats or Dire Wolves to harass them and keep them running away. The only armies where this tactic is not effective are the fellow Undead armies (who are your closest allies anyway). Ghouls, Crypt Horrors, and certain special units have Poison attacks, which slow your enemies and makes them do less physical damage. Spread it around! If you have several units of Ghouls, have them attack several different units of the enemy, inflicting Poison on all of them. Be sure to have a decent unit backing up the ghouls, though, such as Grave Guard, who are better able to soak the lessened damage, and catch up to slowed enemies. Raise Dead deserves its own section because of the important role it plays in Vampire Count logistics and army recruitment. Raise Dead is a recruitment option for any Vampire Counts army led by a Lord. When selecting an army, select the golden skeletal hand listed at the bottom of the army unit window. Using Raise Dead allows the VC player to instantly recruit troops into their army, for a slightly greater cost than recruiting the same unit from a settlement. A VC player can recruit as many troops in one turn as they can afford, and as are available in the Raise Dead window. More and better troops can be Raised at Battle Site Markers. A golden skeletal hand with a plus symbol (+) on the campaign map is a Battle Site Marker; this means that because a large battle with powerful units was fought in this territory, using Raise Dead will offer better and stronger troops. Interestingly, Raising Dead at a valuable Battle Site Marker can let the VC player recruit much stronger units than they can recruit from their own cities, long before the recruitment buildings are unlocked. However, these units are both expensive to Raise, and have expensive upkeep (in the hundreds of monies per unit). First, you may ask, "Why should I bother avoiding Chaos invasions? Mostly, they are things that happen to somebody else." The answer is, "Because after they are done with somebodies else, they will come for you." Chaos and the Vampire Counts (VCs) do not start off at war with one another, which allows the VCs some breathing room before having to confront Chaos - but sooner or later, confront them you will. The confrontation can be postponed for a good long time, until you have the economy and troops to deal with at least 1 Chaos army at a time. The simplest way to avoid Chaos invasions is to never completely seize both Western and Eastern Sylvania. Seizing both territories gives you Mannfred Von Carstein, another faction leader (if you did not start play with him; otherwise it gives you another legendary lord), and starts a countdown to the first Chaos invasion. If you seize both provinces by turn 40 or so, the first Chaos invasion can start anywhere between turn 60 to 100. You may get the occasional warning about "Chaos is coming", but they should not actually spawn armies for a good long, long time, if ever. As mentioned above, Chaos and VCs do not start off at war, so the initiative is on your side. Chaos will be happy for many turns subjugating Norsca and razing Kislev and the northern provinces of the Empire. All-too-soon, however, they will enter your territory. Working the viable VC tactic of inhabiting ruins, you can send a cheap army full of zombies and skeletons in the wake of the Chaos hordes, colonizing new settlements. Expect to lose these settlements. Build only light economic infrastructure, and maybe also Vampiric Corruption buildings if you're flush with wealth. Though the economic gains are small, they add up if you colonize a dozen new cities without much further investment. Vampiric Corruption in your new provinces may whittle down Chaos or Norscan armies passing through your territory, though they are 99% likely to Raid their way across the map, preventing attrition. Causing attrition in this way does not seem to impose a negative penalty on your diplomatic relations (like it did in TWW1). As if normal Chaos Lords were not bad enough, if you and the AI manage to defeat or at least delay the first Chaos invasion, the second wave will be named Legendary Chaos Lords such as Archaon the Everchosen and Kholek Suneater. These increase the danger of Chaos armies geometrically, since they also bring along Regiments of Renown and give themselves economic and replenishment bonuses. At minimum, VCs will need 2 armies to defeat 1 Chaos army if you choose to auto-resolve - including as many armor-piercing units such as Crypt Horrors and Varghulfs as you can. Even then, it is certainly better to manually control the battle and preserve your best units with discrete, effective use and Invocation of Nehek. Chaos units also have high morale and are sometimes immune to Fear and Terror, making their armies almost unbreakable. Having 2 VC armies gives you the chance to surround and more effectively demoralize a single Chaos army. Assassinating their Lords and Heroes is also more difficult, but affects their Leadership just like it does for other armies - then the only issue becomes defeating the naturally-high base leadership of each unit.